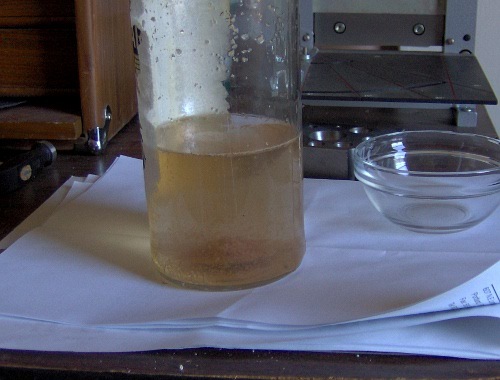 In May of 2007 I prepared to make what is, I hope, to become my first spagyric elixir containing the separated, purified, then reunited sulfur, salt, and mercury of a single plant subject. 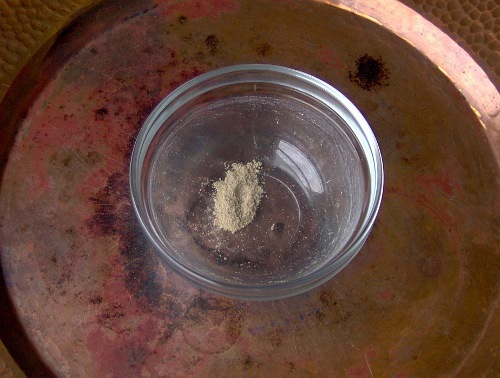 Specifically, the salt that will be purified by fire and water, the mercury and sulfur separated and purified by sedimentation and filtration before reintegration. 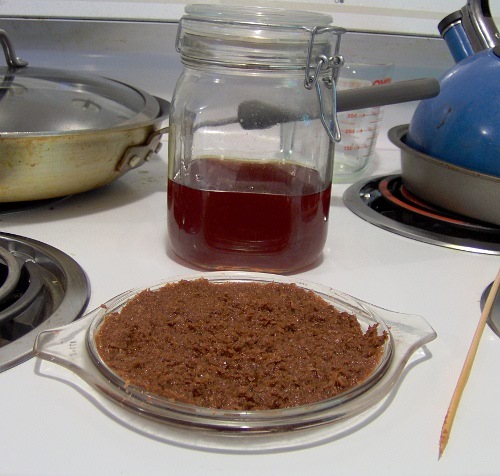 I have made many tinctures before, and had experimented with burning and extracting salts on a variety of other materials (dried blood for cakes of light, a set of initiation scripts, violet flowers, etc.) but these were mainly little tests whose results served my purposes well enough, or operations that failed to continue to develop into the full triple extraction and recombination stage. It was mainly a lack of knowledge, readiness, and equipment on my part that made the initial “repose” of the original tincture so lengthy. In the Summer of 2007 I found my media of choice and swore to set about building a suitable studio for the working of metals and wood, bone, and a variety of other materials. It has taken four years to fulfill that oath and that long for me to ripen enough, myself, to be able to proceed. The continuing growth and maturation of my creative and artistic work bears directly on my spiritual and magical work, and so it makes sense that one must progress in order for the other to truly progress. Really, they are one practice, and not always a conscious one. It can’t be rushed. I’m very glad that I did not toss the tincture out in a fit of vigorous cleaning and nostalgia-elimination as I was tempted to do (several times) in the past four years. This is not a full spagyric operation, as I am not fermenting the plant material on itself and then distilling the liquor to obtain its own specific mercury, nor have I separated the sulfur (essential oil) out from the mercury and refined that before recombination. What I am doing is a somewhat stepped-down version of that, what I can do based on my current state of knowledge and readiness, the materials I have at hand, and local conditions generally. To Jean Dubuis, Brigitte Donvez, Patrice Maleze, Russ House, Mark Stavish, and all of the other Philosophers of Nature I offer my sincere gratitude. Without your work and generosity in sharing it this part of my work would not be possible. The following are some notes and images from that extended and ongoing work. Began rose elixir with four extremely large fragrant red roses from the plant in the north bed. I only began with four because that’s all that would fit in the 1.5 liter glass jar (they’re that big). The plan is to cycle a dozen plus one through the alcohol, extracting the internal water and oils and drying the petals, then grinding all the petals into a powder and re-imbibing them with the liquor for a time. Then I’ll separate again, grind again, and calcine the petal powder in preparation for extracting the salts. Submerged a 3/4 jarful of petals sans yellow tips – the area where the petal attaches to the rose – in 190 proof grain alcohol and within an hour the alcohol had turned the petals translucent and taken on a lively pink hue. I know that to be traditional I ought to be using a distillation (or freeze-off) of a grape liquor like a cognac. I figure doing it this way with the grain alcohol is better than not doing it at all. Perhaps next time I can manage that. For now, the ready-made “Sword of Demeter” (grain alcohol) will have to do. The rose petals from group 1 had gone nearly colorless in the alcohol and group 2 roses were ready for picking and snipping on Sunday morning. Strained out the vivid pink liquor into another clean jar, collected and laid the petals out to dry. Cut and submerged the petals from the next three roses in the liquor, shook, and replaced in the cabinet.Let the colorless petals air dry until Monday night, then spread them on a cookie sheet and placed in the oven for two hours at 200* with the door cracked open. Was startled to find that the petals had turned a very strong and bright royal -almost Tyrian- purple! From the original rose red to translucent/ivory colored to bright purple. They were dry enough I could very nearly powder them in my hands. Crumbled them into small particles and put them into a sealed jar for grinding later (probably sometime today).The 2nd batch of petals turned translucent within an hour. The liquor has gone a deeper red-pink. These will macerate until the next 3-4 roses on the plant are ready to be taken, probably a few days now. Rose twelve of thirteen has gone into the liquor. Color continues to deepen, and the texture of the liquid is definitely not alcohol-dry, but has a distinct smoothness, a slight waxiness about it. All other petals have been strained out, the most recent three laid out to dry. They will go into the oven on Monday.Have rough-ground the previous groups. Were dry enough that they virtually powdered between my fingers. Final rose including morning dew was prepared and put into the liquor yesterday. Hoping to have all the roses’ powdered petals ready to reintroduce into approx. 375ml of the liquor at the full moon for digestion and circulation.Reaching a nice ruby red. This has to be one of the prettiest tinctures I’ve ever seen. Beautiful ruby thirteen-rose tincture, on the eve of its recombining with its dried and ground petals. The parent rose bush is just visible in the background peeking out from behind the bottle on the left. The tincture and ground dried petals reposed in a dark cabinet for four years, with occasional shaking. A very small amount of honey rose cordial was made from this batch and sampled in 2009. It was tasty, but I felt it better to put the elixir back for more maceration/circulation. The cabinet is a kitchen cabinet on an outer wall. The temperature inside fluctuates with the seasons- warm enough to circulate in the summer, but not cold enough to freeze in the winter. The combined rose materials and alcohol are ready for the next phase. The sulfur (oil) and mercury (infused alcohol) of the plant material hovered over a dead and dense bed of mauvish-translucent petal remains. Muck is the best word to describe it. The plant had, with the aid of the mercury, separated into two portions of its extreme components. 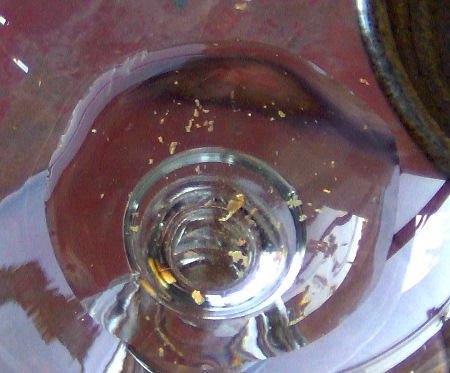 The petal remains were removed from the bottle and spread on to a glass plate. They were an odd combination of crunchy and gooey in texture. Rose mud. This is what I believe is referred to as the “corpse” (or caput mortuum, feces). Good name for it. There was a little bit of the petal material residue still left in the bottle. I added some filtered water, swooshed it around the bottle, and within a minute the petal fragments filled out and the water turned a pale gold tinged with pink, the petal fragments shiny like tiny glitter chips in the water. The scent was heavenly, light and sweet. I set this rosewater aside. Arranged studio/temple working space for dailies as usual, with the additions of a large copper plate on top of the firebricks at the torch station (which is also my main working altar), a small sterling silver scoop and my dagger for manipulating the ash, and a bowl with one of this year’s red rose blooms floating in water in it. The bloom was taken from the same plant that produced the petals. The sacrament was a small amount of the rose-water with a few petal chips mentioned above. I also allowed the bronze Khars seal cartouche I’m making for his seal-disk to be placed near the firebricks on the altar though he isn’t an active participant in this operation. Performed daily pentagram and hexagram rituals (notes to the dailies here) with the addition of a circuit with and presentation of the rose bloom as an offering of beauty to the Gods and Patrons. Rosewater libation was sweeter and more flavorful than expected. The corpse was lit with a flame from the altar light about the time that the sun was setting. Flame was hot blue/violet with golden flashes at the tips. Tiny coals lit and popped. I stirred and turned the burning material with the dagger to keep it going evenly. Once the flames had died down a fair bit of smoke was emitted. It had a strong smell of burning coffee and dirt. It was not unpleasant but it was very strong. I was glad to have the exhaust fan in the window nearby. I turned it on. It would not be a good idea to do this operation without an exhaust fan nearby if performing it indoors. The color of the material was now dark brown mixed with black amid the glowing coals. The more I turned the colas, the blacker and blacker the material got. The quality of the color was velvety black- no gloss whatsoever, light-absorbing soft blackest black. There was a lot of smoke. I let it burn until no more smoke was coming out. Once the mercury and the smoke had departed, I piled the black body up into a mound with the scoop and dagger. The air-acetylene torch was then used to continue the calcination. I had to turn off the exhaust fan during this part as the strong flame was causing some of the lighter whitened material to float up & away. There was not so much smoke now, so it was bearable. 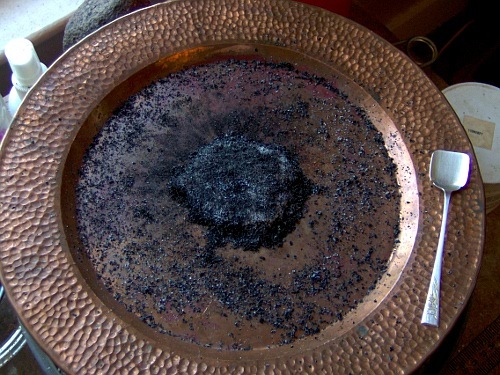 I held the torch flame on the little “mountain” of black ash for five to seven solid minutes, until I saw that the whole inside of the mountain was glowing red like charcoal. I turned off the torch flame and watched the red glow move around inside of the mound. Every now and then, a wormlike form in glowing red would travel near the surface, wind along the surface and then re-submerge. Though I know the scientific interpretation of what was happening, the wormy fire moved in a definite, animated way- lively, wiggly. Salamanders! I watched them move on their own for a while, and then began to feed them with gentle breaths. They increased activity. It was delightful to watch. I hailed and sent a silent thanks to the Dragon their parent and watched them do their thing with fascination. Slowly the black mountain began to get some frosty looking growth around the edges. The work of the salamanders was turning the mountain white (or pale grey) from the inside-out. There was little or no smoke now. The mountain was still emitting a lot of heat. I sat with both hands over the mountain, as close as I could stand it, and just felt the heat radiating from it. When I felt the end of the night’s work was near, and could detect no more visible glow, I did an AUMGN circulation chant with it for a time. Lit more incense, gave JB his libation and thanks, closed the temple and left the mound to cool overnight. Moved a cauldron in which I am degreasing some bone to the porch. I got a strong intuitive nudge that the smell of death must be removed from the place during the night. Performed dailies prior to beginning the day’s work. 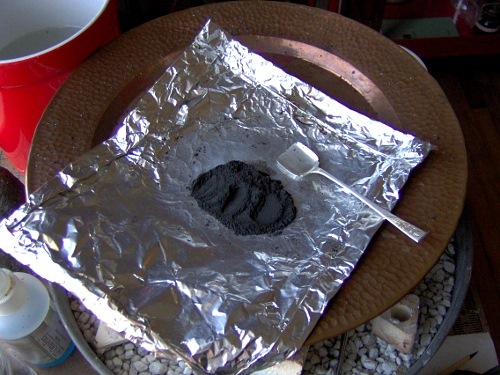 Ground the gray ash (the white and remaining black matter) and enclosed it in a tinfoil envelope for roasting over a charcoal fire. It was placed about 1-2 inches over a reasonably large pile of charcoals in a small covered grill for about an hour, and then another two to cool down. When removed from the grill, the ash had turned a uniform bluish-black, all whitish-gray had gone. The total mass of the pile reduced a little. Ground the black ash and moistened it with about a teaspoon of the red mercury+sulfur liquid. Lit it and let it burn, then continued with the torch for about 5-7 minutes. The small coals burned bright orange-gold with a metallic sheen. I could see the individual coals shrinking in size. Where I applied direct, intense heat with the torch the material pulled up into little “pearls”, small round balls in the ash. I was concerned about applying too much heat too fast because of the pearl formations, because the material was getting more dense instead of less so, and so I eased off. When it cooled, the color was a dark steely gray. The pearls were rock hard in contrast with the lighter fluffier ash material around them. The pearls though very hard are crushable. Care needs to be taken that when they shatter they don’t send pieces flying off the plate. The total mass was much reduced. Executed many cycles of calcination today, at least 10 on the copper plate with acetylene torch. First two rounds started with the assistance of the rose liquor. Progressed to medium gray with pinkish overtones. White powdery material and brick red material mixed in with the darker was produced. Knobby pearl formation continued to form on the surface through the calcinations and were ground with the rest of the ash between subsequent firings. They started large (.5-.75mm) and got progressively smaller through the firings. Cracked a small amount of hard, glassy red residue off of the silver scoop and ground it back in with the rest of the ash. More reduction in the total mass. 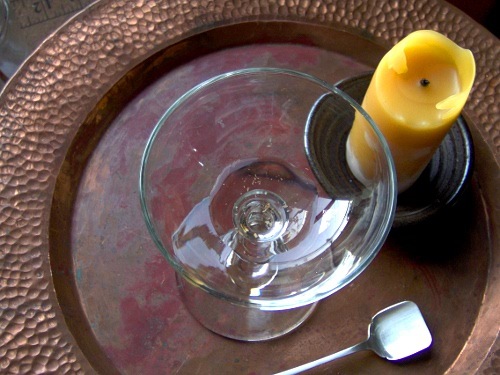 Closed in the usual manner, put a glass cup over the mound of ash to prevent blow-away. Three more cycles of calcination with the torch. Ashes only slightly lighter. Mound continues to exhibit a very very white “halo” around it after application of flame for extended periods, a powdery residue that is easily scraped up and incorporated back into the mound upon scraping/grinding between firings. Need to find out if this is some kind of residue from the acetylene burning, or if it might be emitted by the salts. 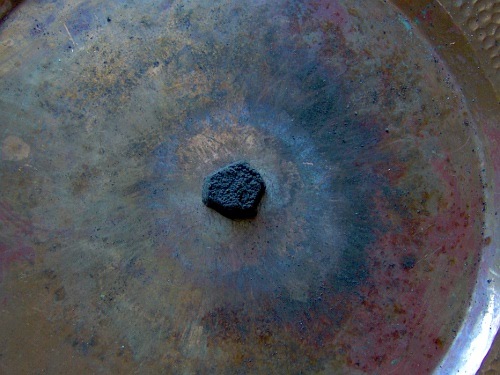 I aimed the flame at an area of the copper dish for a time to see if the white happened there as well, and on a tiny crumb of ash to see if the halo stays proportionate to the size of the mound. No halo on area without ash, halo on tiny speck proportionaltely tiny. 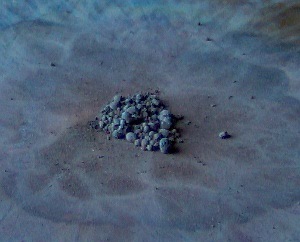 Hard nodules in the salts are dark red outside, white inside upon grinding. Having serious feelings of doubt and incompetency. Compelled to ask the material to forgive my clumsy beginner efforts. I am sure I am not doing this entirely correctly. 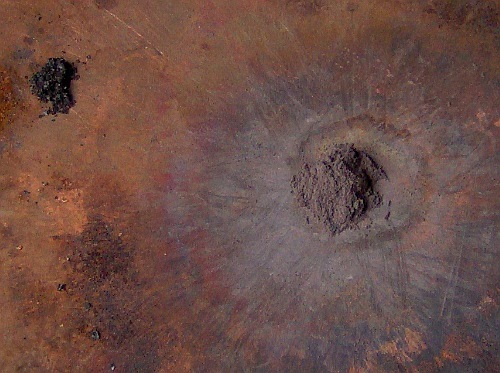 I’ve touched the ash with steel, silver, aluminum and copper- will those metals cause the ash to lose its charge? Have I applied too much intense heat too quickly? I’m not working exclusively on the days and during the hours of Jupiter and Venus. The progression of colors is not exactly as my course material describes- the ash is black, then gray, then white all over. No mention of yellow or red hues until a different stage of the work- the reintegration. I only had a little brief white, and that odd halo stuff (if it counts). 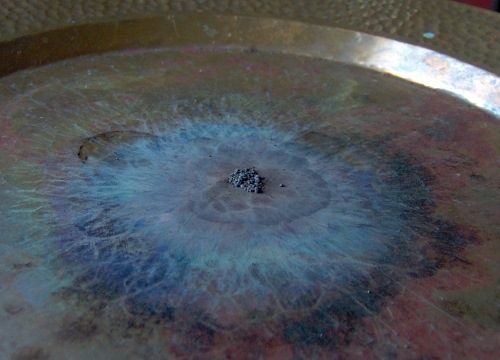 I also allowed the ashes to imbibe more mercury+sulfur liquid between calcinations instead of doing straight calcination to white…due to instinctive prompting. I hope that wasn’t a frivolous fancy, hope that hasn’t totally messed me up. Went back and reread my source material. Felt even more like I’d screwed up. I’m deviating a good deal from the instructions and felt simultaneously that I’m possibly doing what’s exactly right for my process here and now, and that I’m being undisciplined and wasting time in deviating. I’m not solid & sure of either. Had to just sit in circle and pray about it for a bit, be neutral, and trust that the process is doing what it ought. In any case it’s too late to do anything about what’s already been done now. Handed my internal turbulence over, just sat with it, let it be muddy. I am trusting to the material’s own inner strength in withstanding my blundering and relying on my own stubborn persistence. Persistence is a hard to muster at this point. Trying out a third method of calcination, slow roasting in the oven at 500-550*F for 3 1/2 hours. Put pinkish gray salts into a small glass bowl and warmed it with the oven to 500*. I put a tiny amount of darker, newer ash in there as a color check against the main mound. After an hour the salts were much lighter gray with the darker ash a darker gray. I placed a second smaller clear glass bowl inside the other bowl (upside-down) covering the salts to catch any volatile salts that I am told will try to escape once the light gray stage us reached. The second bowl also holds the heat in and slows the cooling-down process. Dailies and carving while they roast. Color a bit lighter when cooled down after 3 1/2 hours at 500*, but still solidly medium-gray. Having a hard time with the calcination to whiteness. 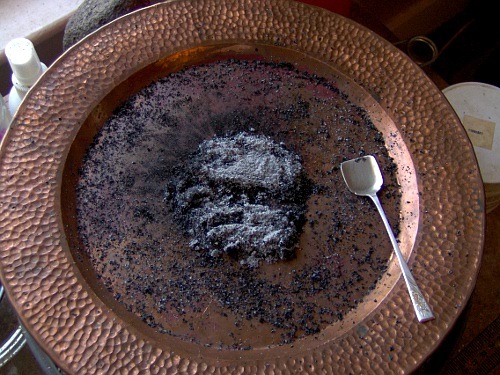 Am going to wrap the ash-salts up and let them repose until the moon is waning again, after we return from Loowit-la (Mt. St. Helens). Perhaps I’ll ask Her about making white ash while we’re there (but discourage any demos). Wrapped the ash+salts in black silk and set aside. Transitioning from the rosewater for dailies-libation to the rose liquor (sulfur+mercury liquid). The salts have not been reintegrated yet, but I can still use it as a tincture in small amounts. Since it would be way too strong to use straight, even in the tiny amount I use for sacrament (about 1/2 tsp), I poured off a small amount into a separate glass bottle and mixed it with an equal amount of filtered water. It is a pale golden red color with a strong scent of roses. It would be about whiskey-strength at this dilution. Today I put about a tsp of the diluted rose liquor in the cup and performed the dailies as usual. When I tasted the droplet off the end of the wand, it was strong and sweet. When I consumed the rest immediately after, all I could think was FIRE!!!! My sinuses opened up and I could feel the heat spread down my throat and expand in my chest the way that really good scotch does. It tasted spicy and hot and only a little bit like rose. I was afraid I might be burning my tongue (I didn’t). I knew it would have a kick but I did not expect the spiciness or the heat. I like it, but next time I think I will try just a few drops diluted in more water. I put the remaining rosewater and petal fragments through a filter. I put the liquid from that into a pyrex dish and set it in a pan on a burner to slowly evaporate the water and see if any salts would come out of solution. If not by fire, then maybe by water? I put the petal fragments and a little more water into a small sealed jar for a possible second extraction later, if any salts come of this. 4:15pm- we have some tiny salt crystals in the dish! A few drops (8-10) of the half-diluted in approximately 6 oz. of filtered water served as the libation for dailies. Strong light flavor, very good. 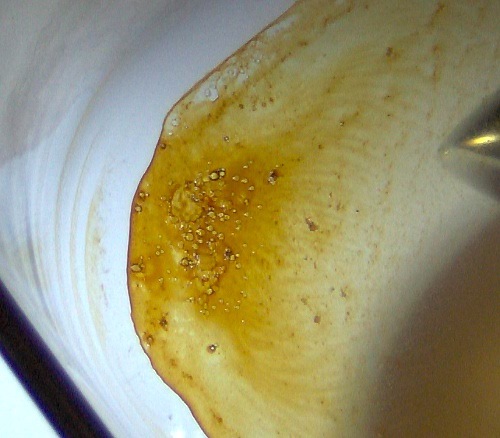 front center, evaporating dish: The above previously hot-evaporated golden-orange residue and salts was redissolved in filtered water and put into the refrigerator for a week. Today it was poured through a (microwaved coffee) filter into an evaporation dish for slow room-temperature second evaporation. top right, small jar: The very small bit of uncalcined petal residue spent the week in a dark cabinet, the liquid and petals taking a light pink tinge. 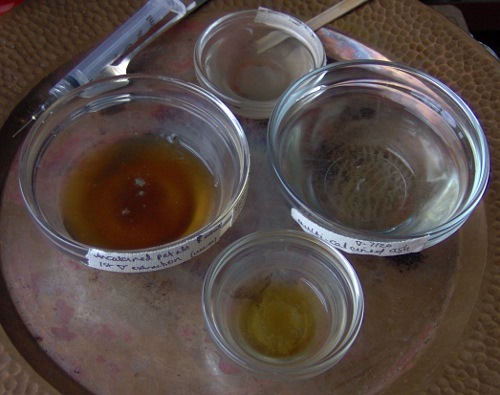 The petal material was strained out of the above liquid (before the hot-evaporation of the liquid on 7/13) that was put into water for a second extraction was filtered and the liquid put into another glass container. This container was put on a metal plate on top of a stove burner turned to the lowest setting for warm-evaporation through the day. top left, small jar: Unwrapped the repeatedly calcined ash and salts, noticed that while still solidly medium-gray, much of the pink tinge had disappeared. The ash residue that had reached a medium gray color was imbibed with a small amount of the golden-orange rose salts water. It was then placed in a small sealed glass container and filtered water poured over it. Any chunks of ash were pounded with a bamboo stick until all was powdery. This jar will be shaken through the day. It almost immediately took on a greenish-gray tinge. Uncovered and filtered the gray green ash solution and poured into another evaporation dish, placed it with the other two. Needed to cover them all with something permeable to allow evaporation to happen and to keep extraneous dust and hairs out. The most suitable thing I had was a pair of sheer stockings. I cut them into tube sections and slid a dish inside each one. I think it should work well. Dried out the very small amount of ash residue remaining along with the remainder of the unburnt petal material for further calcination. The total amount of both together is very small, maybe 1/4 tsp., if that. Ground, calcined, reground, calcined to pearl formation, imbibed the pearls (“dead soldiers”-??) and reground, calcined to pearl formation again (4x). No grinding between second and third calcination, but did imbibe (fired the pearls again as they were). Separated six large pearls from the material and ground the rest to fine powder, covered with water in small sealed jar for salts extraction. Color lightened to dove grey. Pearls darker on the outside, white inside when ground. 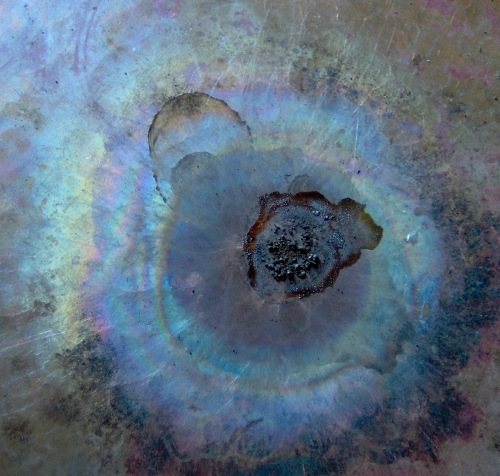 During pearl formation, more so during the last rounds of calcination, the pearls became more fugitive than ever- they would flee the fire, spinning away towards the edge of the dish quickly. Had to catch them with the silver scoop and return them to the central mound. Some would stay, others would fly away both large and small. Did a lot of talking to the material during the calcinations, variations on an encouraging phrase repeated over and over. 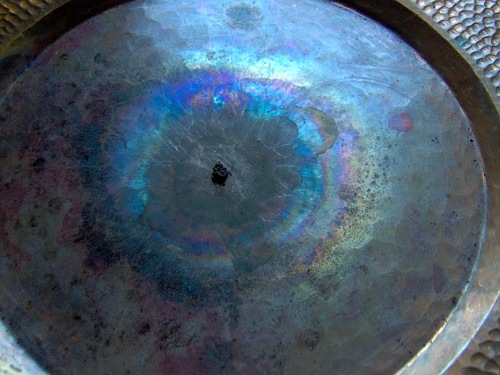 During the four cycles of calcination, the colors coming up on the copper dish were vivid iridescent rainbow hues in halos around the material. 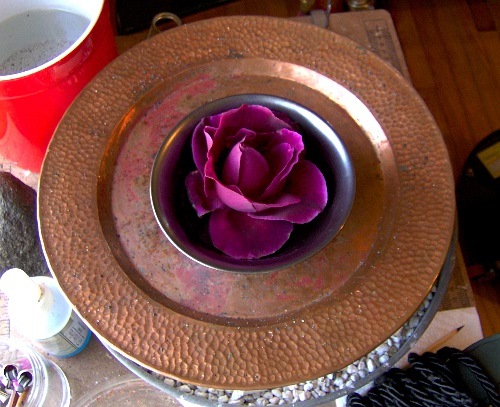 Some of the rose essential oil in the sulfur+mercury mix must be vaporizing outwards as the material burns. 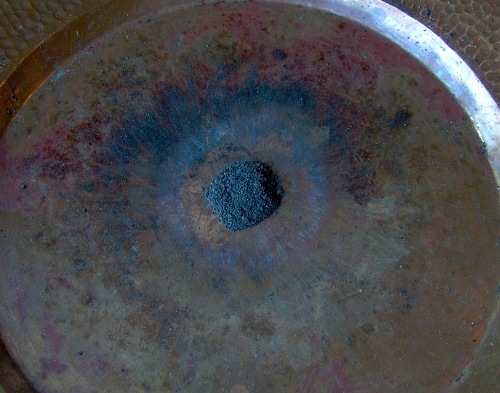 Though I should note that I have soaked the ash with the mercury+sulfur solution prior to calcining several times before and burned without producing any irridescent rainbow halos. 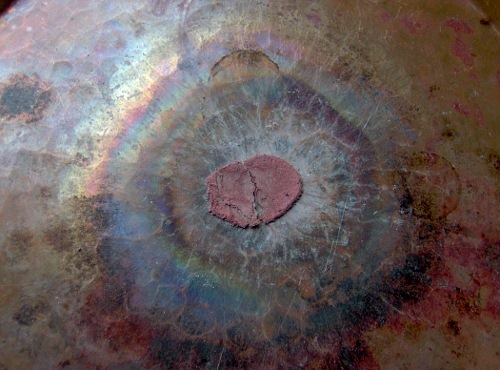 Upon checking the various dishes in evaporation (4 total- the two with the uncalcined material liquids and two with the liquid from both batches of filtered ash residue), saw that in the liquids with the previous uncalcined materials in them – the pink and golden liquids- there were distinct mold cultures forming in little islands floating on the surfaces. There were none on the liquids with the previously calcined materials in them – the graygreen ones. Since I plan on ingesting this product, and the thought of an uncontrolled fermentation/spoilage did not bode well for that, I decided that the best thing to do at this point would be to re-filter each kind of liquid three times and boil off the water. I wanted to do a slow evaporation to obtain large crystals, but for safety’s sake changed procedure. The difference between the liquid that had leached the material that had been purified by fire, and the one that had leached material that had not been purified by fire was dramatic. In absence of the application of fire by artifice, the slow and natural fire of decomposition and its agents began (as would be expected). 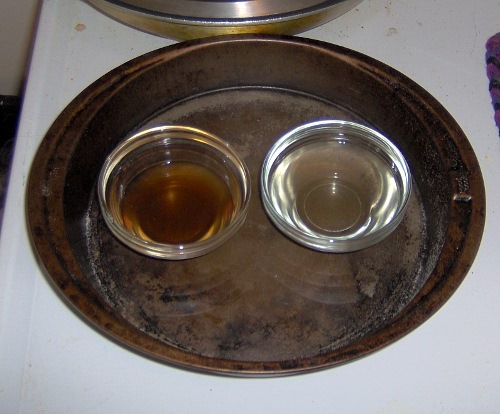 Placed the liquids in glass dishes on a metal pan on top of a burner, brought to just the hint of boiling and then turned to low to evaporate water off. Orange liquid was very slimy even after being put through the filter 3x. Graygreen liquid was not, and appeared eye-clean. As they both reduced, the orange liquid got darker and gloopier and emitted a rotten vegetable smell. It got very gummy and showed only a few minute cyrstals that might be salts. In contrast, pure white particles began coming out of solution in the clear liquid relatively early in the evaporation. 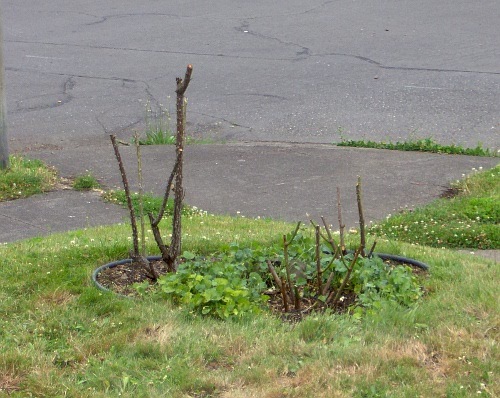 The parent rose bush has been sick with black spot fungus for a couple of years now, kept under control with neem but never eliminated. 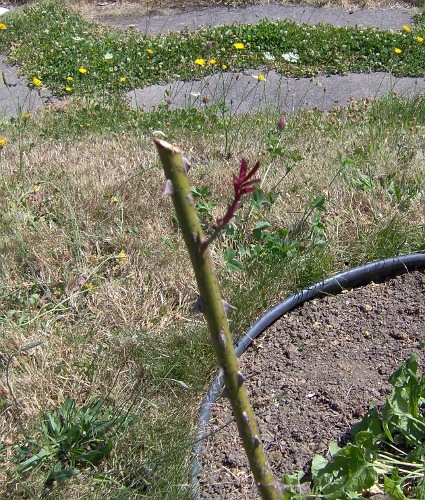 I was moved to make an effort towards healing the rosebush of its infection if possible during this cycle of work. 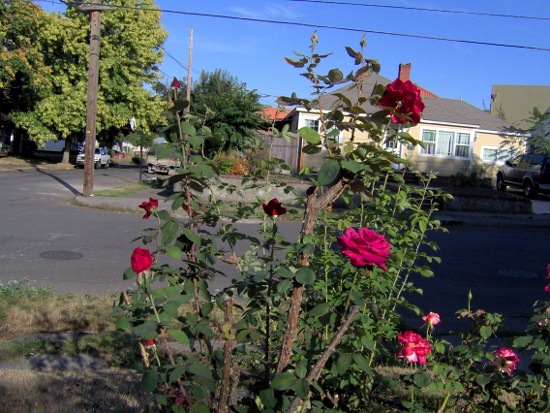 Beginning several days ago I implemented a plan to knock the fungus out and give the rose a chance to grow and thrive again. Completed evaporting the water off of the clean calcined salt liquid. The salts in the dish were white with a yellowish tinge, very light and fluffy. 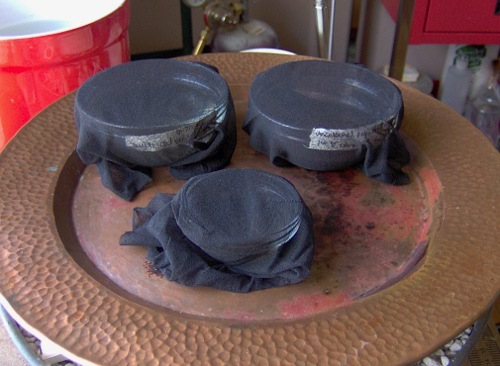 Calcined these with torch, but took care to do it very gently, gradually building heat. Almost immediately the mass went very black again and my stomach dropped. I was afraid I’d ruined it, or not purified the ashes sufficiently, or done something wrong in the leaching. Quickly, white knobby pearls covered the black surface. It soon looked like a brain-surface, the black receding into the spaces between the ridges, then disappearing. When I took the flame away, the ridges/pearl knobs stayed bright white (unlike during the previous calcinations in the ash where they were black- or gray-coated as soon as they cooled). Repeatedly stirred, ground, re-calcined for about an hour until all darkness was gone and the white salts began to take on a rosy pink hue. At this stage, the salts had much less tendency to pull up into pearls. The more I heated, ground, and heated again, the more pink the salts got. Engaged in much singing, prayer, chanting all through this long calcination to red. Stopped when it was time- the course materials say that one can stop when the salts begin to show a pink or orange color after going through the white stage, and the salts are definitely pink, a nice even rosy hue. Additional note, 3:30pm 7/26: pink salts are strongly hygroscopic! I put an inverted dish over them on the copper plate, and when I checked on them a few minutes ago, they were already beginning to get damp. There was a small amount ( a drop or two) of standing water under the salts pile when I moved it! Drying them out again, will put them into a warmed glass vial with airtight lid. Have come into another period of repose. Though I am still using the rose liquor in water for the dailies (which themselves, for the first time, have become intermittent rather than actually daily) it’s not time to consume any of the salts with it, or even use the salts to purify a small quantity of liquor. The rose salts rest in a small airtight dram vial, covered, with my cup on its shelf. The liquor alone continues to work on my life and being, working some uncomfortable but ultimately beneficial changes. I am drawing near to the ending of my old name with the eventual completion of this opus, and have been offered a new one. At this point simply sitting with the new name and the work it implies is the most I can do. Cultivating conscious presence in the day to day activities and just letting it unfold is what there is to do. The rose restored, healthy and robust. The elixir liquid (about 1/2 tsp) has been re-fed to the rosebush with its regular waterings on two occasions in previous weeks. 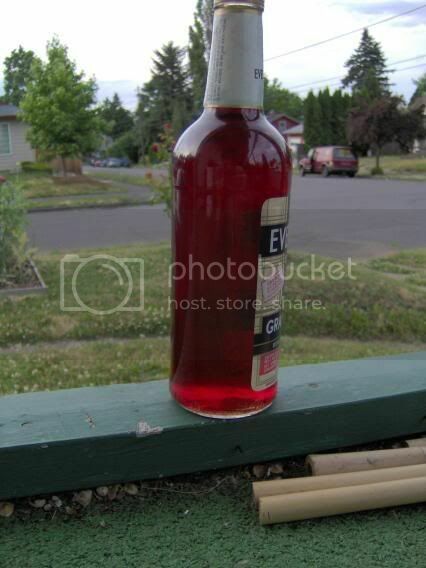 Dailies with intent of sharing elixir with rose while sitting beside rosebush. Clear starry sky, mild temperature. 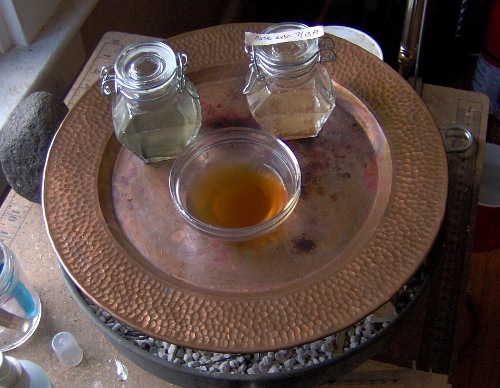 The sacrament was the usual filtered water and ten drops of the rose elixir liquor with the addition (for the first time) of a few grains of the red plant salts dissolved in it. 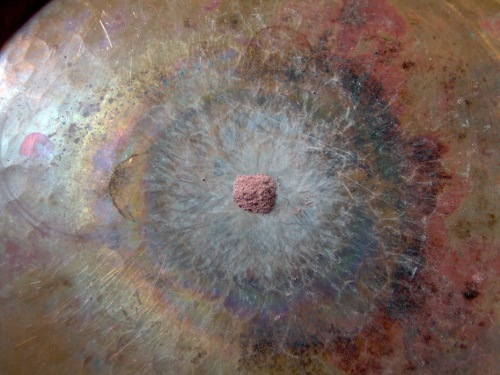 This is the first reunion of salt with the sulfur and mercury. I wished to return, with gratitude and hopefully increased beneficial power for the plant, what I took from the plant. 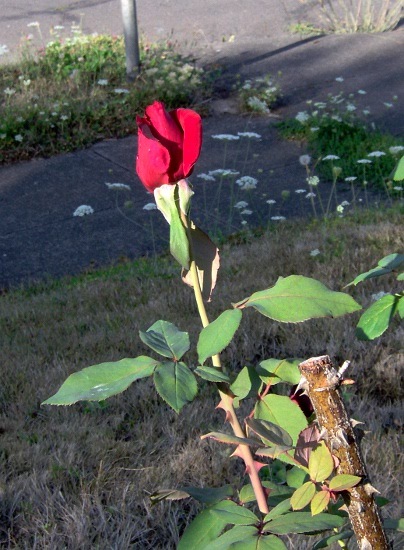 Three portions were poured back into the soil above the rose’s roots. I imbibed a small sip as well. Understood that bringing incense to burn at the place of the rose is superfluous, and if repeated, a possible insult. Excused for not knowing this first time. After the dailies and sacrament sharing, laid down on the ground with my head as close to the base of the canes as possible (in an area clear of the violets). Gazed at the sky and stars through the rose flowers and leaves and sank down. Communion. After a time, turned over onto my belly and rested my face on the earth. Exchange of breath. Sweet scents. Peace and attentiveness on all points.